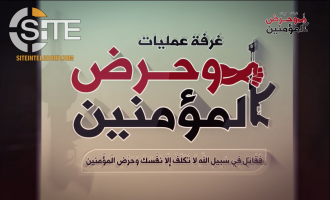 Jama'at Nusrat al-Islam wal Muslimeen (JNIM), al-Qaeda's Mali branch, released a video from its official for the country's Macina region inciting the Fula people there and in the entirety of the Sahel and West Africa to take up arms. A German pro-Hay’at Tahrir al-Sham (HTS) channel published a graphic inciting Muslims living under “Kuffar” [disbelievers] to immigrate. The Afghan Taliban stressed that its attack in the Hazara-majority district of Jaghori in Ghazni province did not target the religious sect but hit only those elements "associated with the Kabul administration". 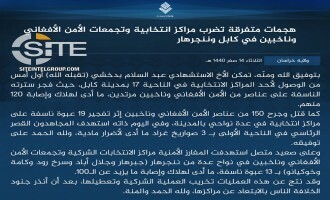 The Islamic State's Yemen Province (ISYP) claimed repulsing an assault by al-Qaeda in the Arabian Peninsula (AQAP) on multiple positions of its fighters in al-Bayda' governorate. The Nigeria-based branch of the Islamic State, West Africa Province (ISWAP), claimed killing an accused spy in neighboring Cameroon. 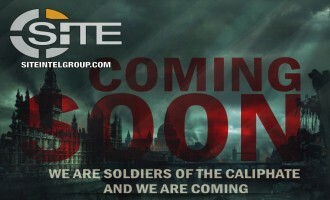 Depicting London and Devastated City, IS-linked Group Warns Fighters are "Coming"
On a poster depicting London and a devastated city, an Islamic State (IS)-linked group warned that fighters are "coming". Hay’at Tahrir al-Sham (HTS) published a photo report of its “elite forces” carrying out military exercises in a show of its preparedness to fight in Idlib. 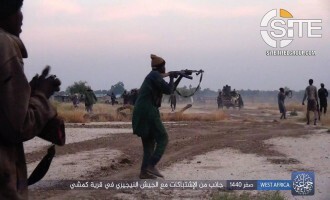 Adopting the Islamic State (IS) style of communique design, and using the "West Africa" name, Jama’at Ahl al-Sunnah Lil Dawa Wal Jihad, or "Boko Haram," claimed attacks on Nigerian positions in Borno State and published photos. Afghan Taliban Remarks that Insider Attack Killing Utah Mayor in Kabul Indicative of Peaking "Anti-Occupation Sensitives"
The Afghan Taliban remarked that the November 3, 2018, insider attack in Kabul in which Utah mayor Brent Taylor was killed is indicative of peaking "anti-occupation sensitivities" among Afghan armed forces. The Islamic State (IS)-linked al-Battar Media Foundation published an article on the murder of Jamal Khashoggi in which the author found God simultaneously "humiliating" the Saudis and punishing the Washington Post journalist. 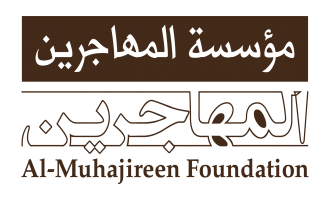 Al-Qaeda's as-Sahab Media Foundation launched a website on which it hosts its recent publications from Ayman al-Zawahiri and other group propaganda. The Islamic State (IS) released a video featuring footage of its attacks from several months ago on Syrian regime forces in Albu Kamal. The Islamic State (IS) claimed five bombings in Baghdad in one day targeting Shi’ites. The Islamic State (IS) claimed inflicting 50 casualties among Syrian Democratic Forces (SDF), or what it calls “PKK,” in a car bombing in Raqqah. 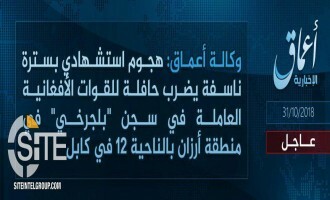 The Islamic State's West Africa Province (ISWAP) claimed bombing a Nigerian army vehicle near Lake Chad. 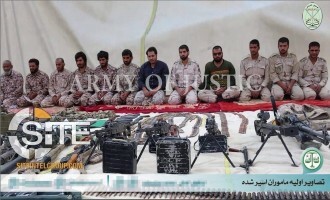 The al-Bayda' division of the Islamic State's Yemen Province (ISYP) claimed attacks on an al-Qaeda in the Arabian Peninsula (AQAP) position and Houthi fighters in separate incidents on the same day, both in al-Quraishyah district. 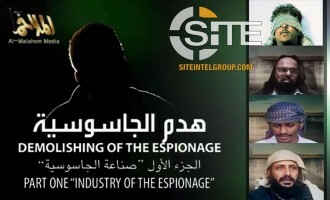 A foreign fighter-centric Islamic State (IS)-aligned group published a biography of an alleged Canadian who it claimed is behind the January 2015 hacking of the Twitter account of U.S. CENTCOM. Using a photograph depicting Pope Francis with the Coptic Pope Tawadros II on a visit to Egypt by the Roman Catholic pontiff in April 2017, an Islamic State (IS) linked group incited violence against Christians. The Afghan Taliban acknowledged that a delegation from its Political Office will participate in the upcoming Moscow conference. 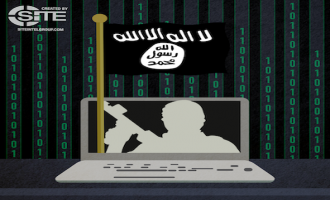 Islamic State (IS) supporters distributed tips from an aligned group for promoting IS propaganda efficiently and securely. The Islamic State's West Africa Province (ISWAP), its Nigeria-based branch, claimed killing 15 African coalition forces and seizing temporary control over a town in Maiduguri. Jihadists distributed a video attributed to Mujahidin Indonesia Timur (MIT) wherein a fighter in Poso rallies others to persevere against the enemy and never surrender. In the video, a fighter flanked by two armed men gives a speech in Indonesian, advising fellow fighters to be firm in the "fields of jihad" and to rely in God to grant them victory despite the gross imbalance in their numbers and weapons against those of the enemy. 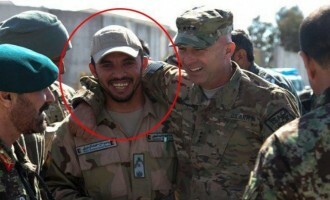 Lauding the Afghan soldier who killed an American soldier in an insider attack in Kabul, the Afghan Taliban urged members of the Afghan armed forces to follow his example. The Islamic State (IS) claimed credit for the ambush of Coptic Christians in Minya, Egypt, in a formal communique, declaring that the operation came in "revenge" for the arrest of female Muslims. Continuing to maintain that its fighters shot down a military helicopter in Farah, the Afghan Taliban declared that it will not deliver the enemy corpses from the crash until the Afghan government delivers the body of the executor of the insider attack at a base in Kandahar. 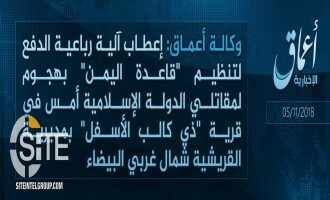 The Islamic State (IS) claimed credit through its 'Amaq News Agency for the attack on Coptic Christians in Minya, Egypt. 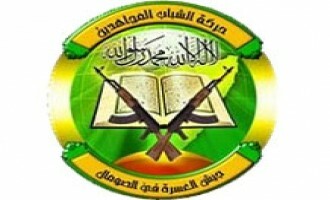 Ciitng a "security source," the group reported that the executor of the ambush were IS fighters. An Islamic State (IS)-aligned group suggested the use of explosives on airplanes and hidden in targeted vehicles to strike the enemy. The Islamic State (IS) released the 14th episode in a video series providing statistical breakdowns of IS operations, covering in this installment the week of October 25-31, 2018. 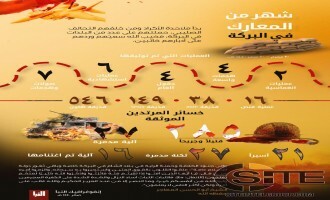 The Islamic State (IS) featured an infographic in the 154th issue of its Naba newspaper that detailed statistics from one month (September to October) of the ongoing U.S.-backed Syrian Democratic Forces (SDF) offensive in Deir al-Zour, Syria. 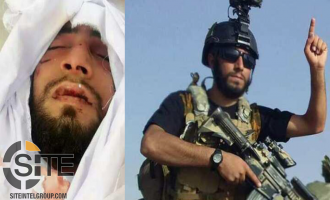 More than a week after an Afghan commando opened fire on a NATO base in Shindand, Herat, Afghanistan – leading to one killed and two wounded – the Islamic State (IS) claimed the operation was carried out by a “Caliphate soldier” in Naba 154. “Incite the Believers Operations Room,” a Syria-based al-Qaeda (AQ) aligned coalition group, issued a photo report on its shelling of SAA forces in Aleppo, marking its seventh operation claimed in a week. The Syria-based al-Qaeda (AQ)-aligned Hurras al-Deen gave a eulogy for one of its officials, a member of both its Leadership and Shura councils and a veteran of the jihad in Iraq. Drawing from the call for attacks in the West in the 8th episode of the Islamic State's (IS) "Inside the Caliphate" video series, an IS-linked group advised vehicular strikes. The Islamic State's Khorasan Province (ISKP) issued a formal communique for the suicide bombing near Pul-e-Charkhi prison in Kabul, Afghanistan. 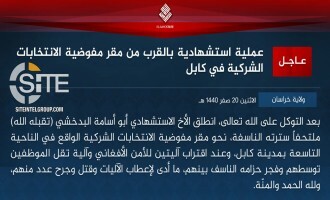 The Islamic State's (IS) 'Amaq News Agency reported that the group is responsible for the suicide bombing that struck a bus carrying employees of Pul-e-Charkhi prison near the location in Kabul, Afghanistan. The Afghan Taliban took credit for downing a military helicopter that reportedly crashed into a mountain due to bad weather. 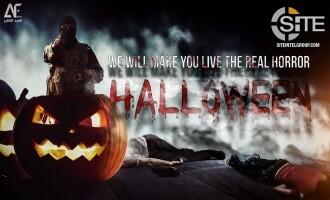 An Islamic State (IS)-linked group used the celebration of Halloween to instill fear of attacks and their horror. 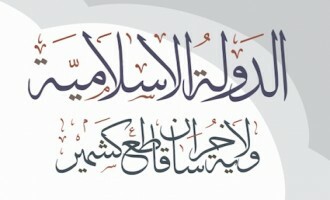 Al-Qaeda in the Islamic Maghreb (AQIM) released a statement condemning recent niqab bans in Algeria. The Islamic State (IS) released the 13th episode in a video series providing statistical breakdowns of IS operations, covering in this installment the week of October 18 - October 24, 2018. 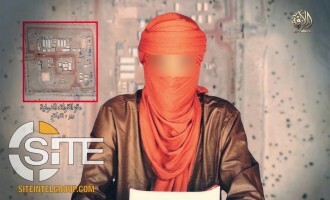 Al-Qaeda in the Arabian Peninsula (AQAP) video breaks down the recruitment and activities of spies in extended interviews with infiltrators linked to Saudi intelligence. 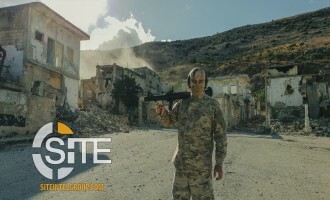 The Islamic State (IS) released the eighth installment of its “Inside the Caliphate” video series, breaking from other installments by highlighting past attacks and attack directives, and instructing on adherence to the group’s propaganda machine. 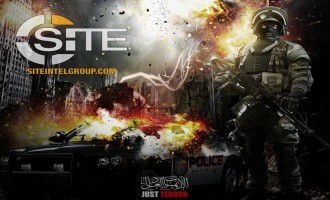 Threatening Americans with “flame and sharp knives,” an Islamic State (IS) -linked media group distributed an English-language graphic depicting urban warfare. 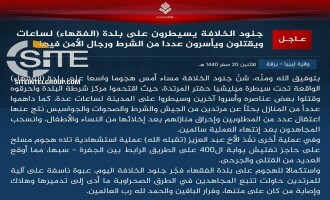 Incite the Believers Operations Room, a Syria-based jihadi coalition, claimed an attack on the Syrian Army (SAA) and two attacks against SAA-aligned militia forces. The Mali-based branch of al-Qaeda (AQ), Jama’at Nusrtat al-Islam wal Muslimeen (JNIM), released a video statement claiming an attack on International Forces barracks in Timbuktu. 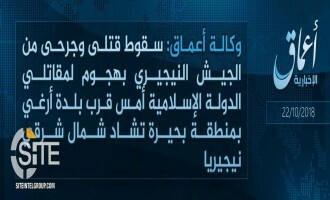 The Islamic State’s (IS) Libya Province claimed a widespread attack on Haftar loyalist positions in Jufra district, which included a suicide operation. 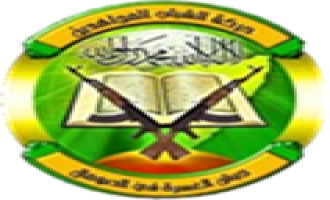 The Shabaab al-Mujahideen Movement, al-Qaeda’s (AQ) branch in Somalia, claimed the bombing of an Ethiopian military convoy in the central part of the country. 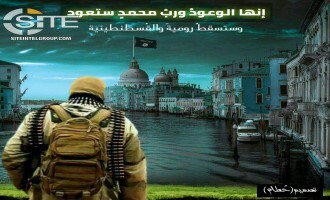 Pro-Islamic State (IS) media groups warned America, France, and Italy of attacks, depicting, for example, the IS flag in Venice and the Eiffel Tower collapsed in Paris. The Islamic State's West Africa Province (ISWAP) claimed killing 29 soldiers in two attacks within an operation in the Nigerian town of Gashigar. 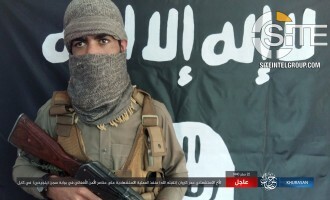 The Islamic State's Khorasan Province (ISKP) claimed credit for the suicide bombing near the headquarters of the Independent Election Commission headquarters in Kabul, hitting employees and security forces. 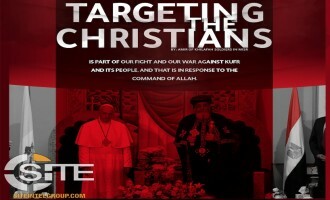 In its second poster in what it dubbed a campaign, an Islamic State (IS)-linked group depicted the assassination of Pope Francis. 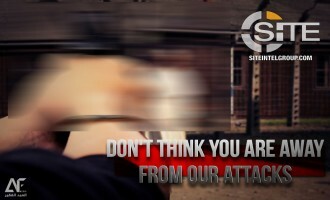 Again using a stock image of a concert, an Islamic State (IS)-linked group warned of attacks on such venues and used incitement from IS spokesman Abu al-Hassan al-Muhajir. 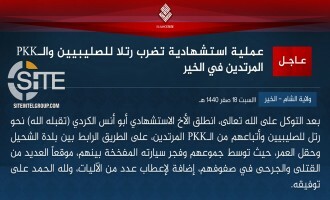 The Islamic State's (IS) Syria division claimed inflicting casualties among "Crusaders" and "PKK" in a suicide bombing on their convoy in Deir al-Zour. 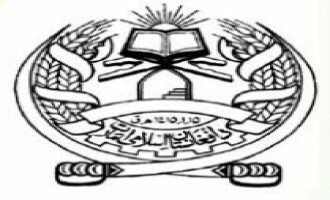 Afghan Taliban Condemns U.S. Treasury Designations of Officials as "Exhibitory in Nature"
Responding to designations by the U.S. Treasury Department and financial sanctions imposed on its officials, the Afghan Taliban condemned them as "ineffective" and "exhibitory in nature". Hay’at Tahrir al-Sham (HTS), a Syria-based jihadi group, released photos of a “new batch of graduates,” showing their training and graduation from a northern Idlib training camp. 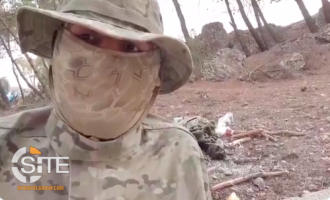 A Syria-based jihadist training group’s leader posted photos and videos of his life as a fighter in the country on social media platforms. The Islamic State (IS) released a video showing its operations against "PKK" forces in Syria's Deir al-Zour governorate, including an raid on their positions in the perimeter of Hajin, and then fighters celebrating their victory in city streets to the cheers of onlookers. 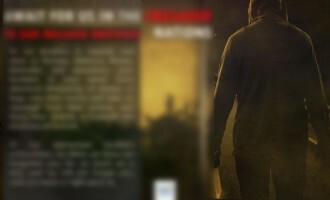 A foreign fighter-centric pro-Islamic State (IS) group published a biography of an alleged American from Michigan who served as an IS cameraman in its battles in Syria. Islamic State (IS) supporters distributed a message inciting for "martyrdom" through lone-wolf attacks in the West and giving ideas. 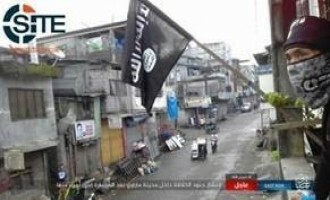 A message attributed to a Filipino Islamic State (IS) operative who reported on events in Marawi in the past, declared that fighting in the Philippines is not over, and threatened revenge against America, Australia, Israel, and China. Depicting Pope Francis and an Armed Fighter, IS-linked Group Warns "Slaves of the Cross"
An Islamic State (IS)-linked group depicted Pope Francis and an armed fighter to warn the "slaves of the Cross". 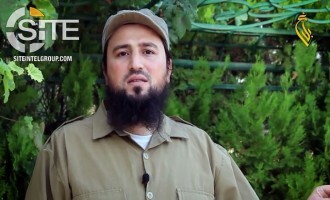 Yahya Abu al-Hammam, the deputy leader of al-Qaeda's (AQ) branch in Mali, Jama'at Nusrat al-Islam wal Muslimeen (JNIM), warned members of the Mécanisme Opérationnel de Coordination (MOC) to repent and leave their service or be pursued by fighters and killed. 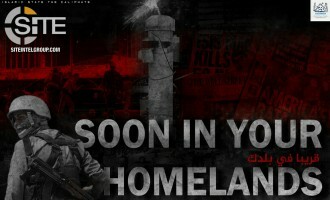 The Turkistan Islamic Party (TIP) launched a new report video series concerning events relevant to Muslims and jihad in a number of countries including Afghanistan, China, Somalia, and Syria. The Afghan Taliban remarked that Afghan generals and "loyalists" are responsible for saving the top U.S. commander in Afghanistan, General Scott Miller, from the recent assassination attempt in Kandahar. 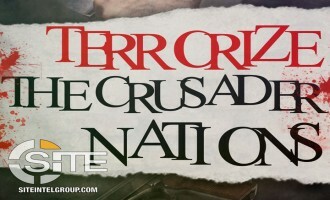 An Islamic State (IS)-linked group incited supporters to "terrorize" Western states in a blood-spattered poster. 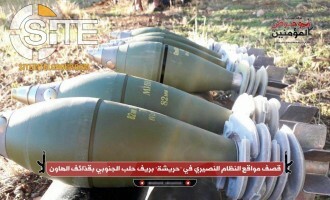 A jihadi coalition in Syria called "'And Incite the Believers' Operations Room, which involves the pro- al-Qaeda (AQ) Hurras al-Deen, photographed an artillery attack on villages adjacent to Jurin in Syria's Hama governorate. The Dijlah division of the Islamic State's (IS) Iraq Province released a video of its operations against tribal militiamen in northern Iraq, including one attack during a soccer game. 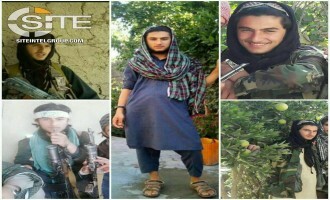 Jihadists professing membership in what they call Islamic State Jammu and Kashmir (ISJK), or Jundul Khilafah Kashmir, launched a newsletter featuring articles by alleged fighters. 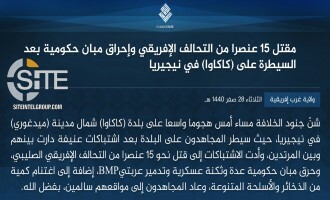 The Islamic State's Khorasan Province (ISKP) issued a formal communique for its election day attacks in the Kabul and Nangarhar areas in Afghanistan. The pro-Islamic State (IS) Khattab Media Foundation threatened an American law enforcement official over the arrest of a group member. 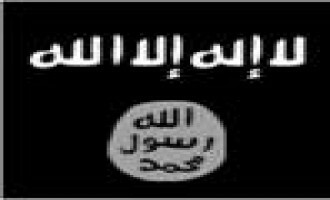 The Islamic State's (IS) 'Amaq News Agency reported that on October 21, 2018, the day of parliamentary elections in Afghanistan, group fighters disrupted the electoral process in Kabul and Nangarhar with 32 bomb blasts and a suicide bombing. 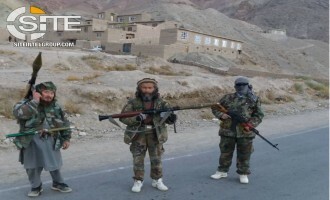 A Balochistan-based Sunni jihadist group claimed the “arrests” of twelve Iranians from Badr Air Base. The pro-Islamic State (IS) Ashhad Media Foundation released a video in which it portrayed Hurricane Michael and its devastation to the Florida Panhandle as "torment" from God in response to the IS' supplications. 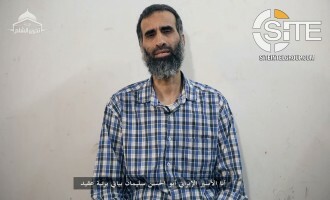 The Syria-based Hay'at Tahrir al-Sham (HTS)) released a video of a captive Iranian Revolutionary Guard Corps (IRGC) officer appealing for his release. 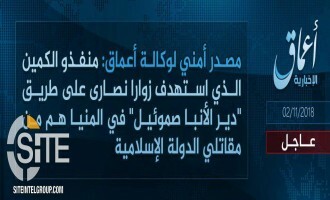 The Islamic State's (IS) 'Amaq News Agency reported that IS fighters attacked Nigerian soldiers near Arege, near Lake Chad, in Borno State. The Afghan Taliban claimed downing a U.S. military helicopter in Logar, a province in eastern Afghanistan, killing and wounding "dozens" of Afghan and foreign forces. 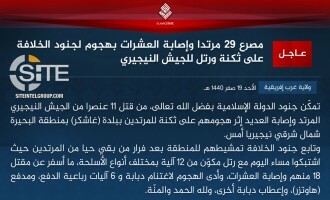 The Islamic State's Yemen Province (ISYP) claimed attacking two positions held by al-Qaeda in the Arabian Peninsula (AQAP) in the Qifa area in al-Bayda'. The Afghan Taliban claimed a total of 407 attacks throughout the country on the day of parliamentary elections, and that among its activities, fighters detained 30 civilians seeking to cast ballots. The Islamic State's (IS) 'Amaq News Agency released a video showing dead children being pulled from the rubble following what it described as "coalition aircraft bombardment" in Nangarhar, Afghanistan. An Islamic State (IS)-linked group reminded of the 2016 shooting at the Pulse nightclub in Orlando, Florida, in a poster warning of attacks. 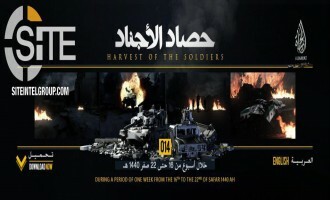 The Islamic State (IS) released the 12th episode in a video series providing statistical breakdowns of IS operations, covering in this installment the week of October 11 - October 17, 2018. 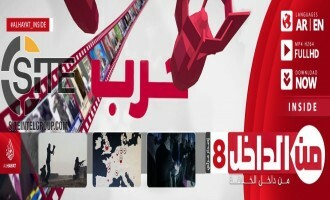 Following Up on Election Day Threat, Afghan Taliban Claims 166 Attacks and Boasts of Rendering Process in "Shambles"
After warning various strata of Afghan society from participating in the parliamentary elections, and threatening attacks on polling sites and cutting off the routes to them, the Afghan Taliban claimed 166 attacks and boasted of rendering the electoral process in "shambles". A foreign fighter-centric pro-Islamic State (IS) group gave a biography for an alleged teenage Belgian sniper who was killed in a coalition airstrike in Deir al-Zour. An official in the Syria-based Hay'at Tahrir al-Sham (HTS) spun the murder of Saudi journalist Jamal Khashoggi and the seeming refusal of the international community to punish Saudi Arabia as a call to Sunnis to take up arms to defend themselves and their land. In three statements from different bodies within its organization, the Afghan Taliban warned various strata of Afghan society from participating in the upcoming parliamentary elections, urging they stay home and boycott and not allow their spaces be used for the process. A foreign fighter-centric pro-Islamic State (IS) group gave a biography for an alleged American IS member it identified as a surgeon from New York who treated fighters on the frontlines. Abu Salman al-Shami, a former Arabic teacher, narrated a film about why he chose to become a suicide bomber and leave behind his wife and young child. The Afghan Taliban claimed killing senior Afghan officials in an assassination attempt on the top U.S. commander in Afghanistan, General Scott Miller, in Kandahar province. The Afghan Taliban claimed killing six American soldiers and wounding four others in a suicide bombing on their convoy in Bagram district in Parwan province. 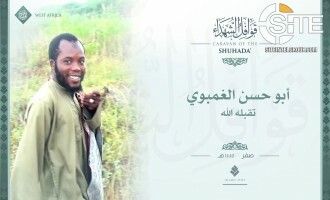 The Islamic State’s West Africa Province (ISWAP) identified a Gambian fighter as a “martyr”. Malhama Tactical, a Syria-based militant training group with close ties to Hay'at Tahrir al-Sham (HTS), announced the completion of a new training camp and that the group will begin training there within the next few days. 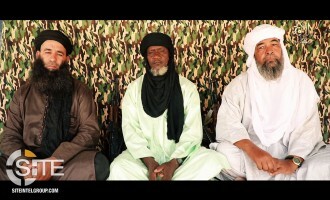 An Islamic State (IS) supporter mourned a slain Senegalese fighter and his brothers, and remarked that West Africa is witnessing a "major Islamic awakening".